The 2011 Wade Christmas Bonanza takes place on Saturday 3rd December at the Wade Collectors Centre, Ford Lane, Arundel, West Sussex, BN18 0EF from 10am – 2pm. The Bonanza features a number of special editions & day specials from both C&S Collectables and the Wade Collectors Club. Also at the show will be the Wade Collector of the Year award. 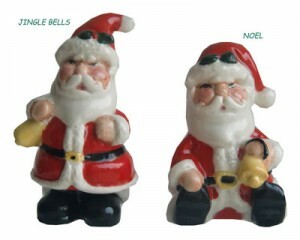 Jingle Bells Santa will be launched at the show and he is a great partner for this year’s Noel Santa (pictured right). Available on the day will be specials from the Club and C&S. These will be a pair of Angels and a pair of gold and silver colourway Betty Boop Cheers whimsies. Both will be limited editions of just 75 pieces. Visit the WCN Wade Pottery pages.